It can be easy to let your dental hygiene habits slip. Life comes at us fast – family, work, fun – it can be hard to balance. Plus, it is so easy to let boring things like brushing and flossing fall by the wayside. Gum disease is one of the dangers that can creep into your mouth without any noticeable signs or symptoms. Gum disease is one of the many reasons we at Middle Creek Dental encourage you to visit us at least two times a year for a cleaning and dental exam. The early stages of gum disease is known as gingivitis. Gingivitis is known to have hard to detect symptoms. People with it probably won’t feel any discomfort or easily notice any signs. 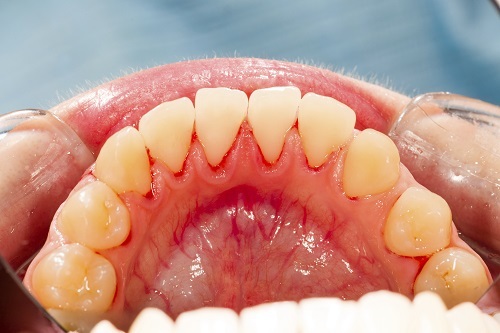 To detect gingivitis, we generally look for gums that bleed easily and are red or swollen. Healthy gums should appear pink in color. Another sign of early gum disease is bad breath that just won’t go away. If gingivitis is allowed to progress it can reach the more serious classification of periodontitis. Periodontitis is similar to gingivitis in that it is hard to know when/if you have it. Discomfort is rare but other signs will start to show. When the gums start to separate from the teeth leaving a gap, or if the teeth start feeling loose to the touch that is a telltale sign of periodontal disease. If caught in the early stages, gum disease can be controlled and even reversed. You can have your healthy gums back if you pay very close attention to your oral health and work to reverse the trend of the deterioration of your gums. If not caught early enough, or if it allowed to progress, gum disease can easily lead to tooth and bone loss. Gum disease progresses from soft to hard tissue. As mentioned, it starts with inflamed gums which deteriorate and eventually it spreads to the teeth. Finally, once the teeth have been thoroughly affected it can spread to the bone underlying the gums and teeth. It is not uncommon for advanced cases of periodontal disease to result in full tooth loss. The biggest risk factor for gum disease is the lack of oral hygiene. If you are not actively taking care of your mouth, there is a good chance that at some point you will develop gum disease. The amount of time a mouth can be neglected before developing gum disease differs greatly from person to person. Smoking and tobacco use puts people at high risk of developing gum disease as well. Pregnancy and diabetes can also allow it to gain purchase in your mouth. At Middle Creak Dental we encourage regular dental and periodontal checkups for all our patients. There is a lot we can do to slow, reverse, and treat gum disease. Treatment methods vary based on how far the disease has been allowed to progress. Please give us a call today at (208) 505-9975 to schedule your appointment.